Wednesday, December 03, 2008 Posted by Stephanie H.
When shopping for a chiminea, it is possible to become a little overwhelmed. What color, size, material, or manufacturer is the best choice for you? Do you have a spacious backyard or a small patio? Will you use your chiminea frequently or just once in a while? These are issues that should be considered when purchasing any outdoor fireplace unit. Before a decision can be made, consider the reputation of the company that you will do business with. One great company is the Blue Rooster Company. 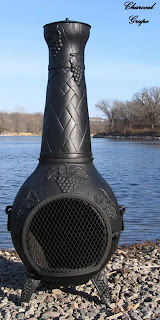 Based in Minnesota, they are a designer, builder, and manufacturer of high quality outdoor chimineas. They have been in business for over 10 years. With that decade of experience, Blue Rooster takes pride in the solid construction and attention to detail in every chiminea that they manufacture. Everyone knows that a knock-off is not the same as the real deal. There are products that are made to look similar to those of the Blue Rooster Company. Although their products’ looks may be duplicated by other companies, their manufacturing quality cannot be. If you see a similar design, check to make sure it is a Blue Rooster Company product. Take for instance the Blue Rooster Grape Chiminea. This is a popular mold and if you are shopping for this design you will see that there are a number of other manufacturers that have a similar chiminea. If you want the Blue Rooster quality, make sure that the Grape Style Chiminea you are considering is indeed made by the Blue Rooster Company. When you do make that final decision, don’t forget to purchase a fire resistant chiminea pad. They will help protect your deck or patio material from wayward sparks or embers.